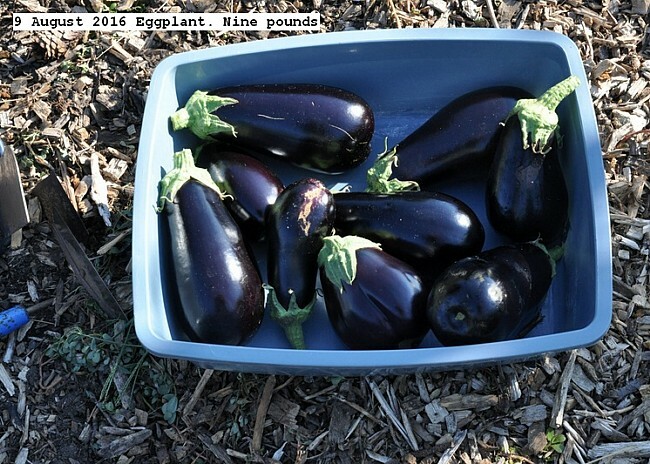 Eight eggplant were placed outdoors. Four Dusky and four Black Magic. These grow well in the garden. One pest is the Colorado Potato Beetle, which are manually removed when they appear. We get a lot of flea beetles. DE works pretty well. 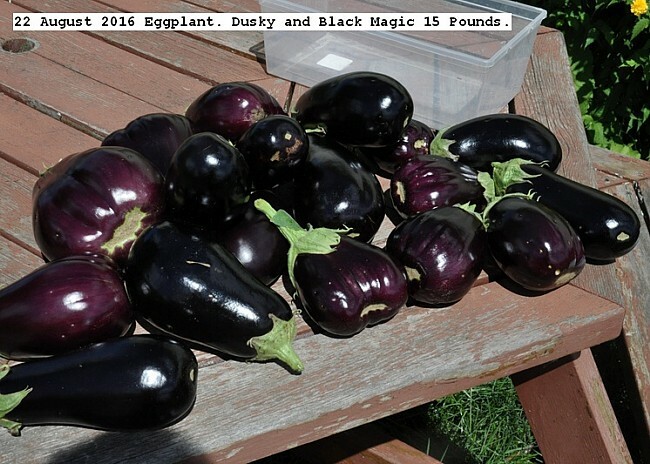 I had no pests,except the occasional tomato hornworm on my eggplants in AZ but NC is a different world! Is that late for your season, or right on time to plant out? Looks as if you are off to a great start with two varieties that I am not familiar with. My Aswads (Iraqi) have finally sprouted, I had almost given up on them. You should start a post about your Aswads. Thanks for posting. 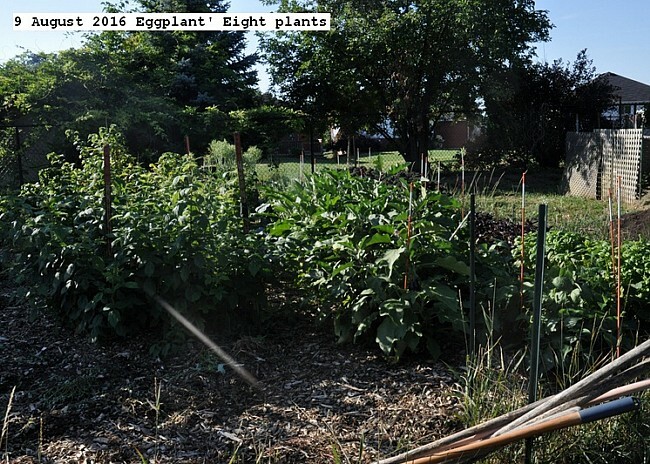 You got 2 harvests (in August)? I got two waves from my plants in PA (different variety). It seemed like they outdid themselves, took a breather, and then started again. Only the cooling weather is slowing them down. From your original photo the spacing looks fairly close. It obviously works well though. Can I ask for your exact measure? There are 8 plants about one foot apart. 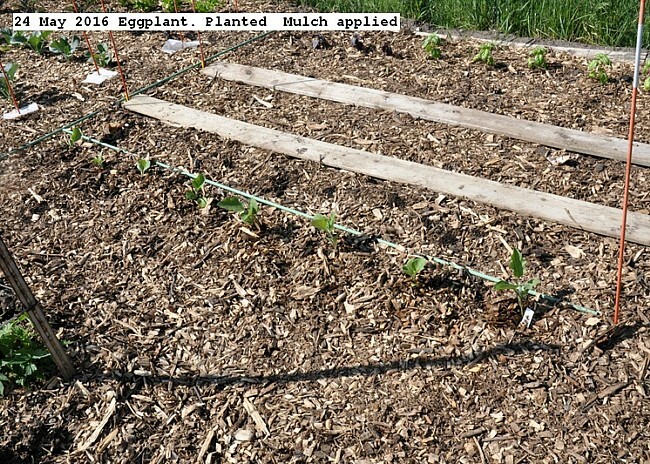 It is ideal if the plants are close enough to shade all the soil between them. The roots in general for most plants need a maximum root space of about a foot diameter. Any open to the Sun area is non productive and a water evaporator. Often excessive spacing is left to facilitate harvest. This is usually not a major issue in a small home garden. My criteria is a complete canopy covering all soil upon looking from a short distance.